Round 1: Caps v Flyers - I can always hope for a helicopter crash at Verizon center eliminating both teams from the playoffs, right? Flyers surged to get where they are now squeaking in the tournament with its next to last game. The Capitals are a really complete team? Are they playing their best hockey? Nah. They didn't need to since the beginning of March. Capitals will edge the Flyers but it will be a battle. Pens v Rags - The Penguins are a nightmare to any NHL team now. Winning 13 of 15 to end the season, everything has gone right for the Pens in March. The Rangers D are banged up and Lundqvist didn't complete practice as of writing this (4/11/16). The Penguins have served them lunch all season long winning the season series. If Fleury starts Game 1 on Wednesday I don't see this lasting too long. Isles v Cats - The Islanders are a terrible hockey team. Yes, they made the playoffs on Tavares' shoulders. The Panthers have a high young octane offense riding the Brontosaurs of Jagr. Jagr is life, Jagr is love. Bolts v Wings - The defending Eastern Conference Champ Lightning, have a fast hard-working team that has suffocating defense and fast micro-wingers. Sadly, no Stamkos. The Lightning can only go as far as Stamkos takes them. The Red Wings have dudes you remember from 10 years ago and Dylan Larkin. Stars v Wild - The Wild have had a strange streaky season. The Stars are one of the most complete teams in the West. If the Stars get Seguin back in anytime before the 1st round ends, they will send billion-dollar man Parise and Co. packing. Hawks v Blues - The Blues are my second-love. They have an amazing squad from top-to-bottom. Only time will tell how the loss of Backes in the line-up will be. Smart money is on the Blackhawks, the perennially succeed and know how to win. This will be a bloodbath and I'd love to pick the Blues but the Hawks have been to the dance too many times to fail. Ducks v Preds - The Ducks are the Penguins of the West. Started below expectations and turned their season around in a big way. The Predators are that guy you see a bar and swore you know him from somewhere, you make eye contact and maybe nod but you go about your night. Ducks all day. Kings v Sharks - This is another case of a good team going up against the pedigree of a potential dynasty. The Sharks overachieved this year building a good campaign on the back of The Joes. The Kings are far too deep and talented to have an early trip to the golf course. I honestly hate brackets and swore to myself that I would NEVER do one for any sport as they tend to drive people insane. HOWEVER, I wanted to be a team player, so here it is. Is it wishful thinking? Possibly. But that very well could be for any of the teams. Few people will accurately GUESS the actual end result and I'm not about to lose sleep over a guessing game. With that said, Buckle Up Baby because it's The Cup. Let's Go Pens! It's always fun when the head and the heart can agree when filling out a bracket. I have the Pittsburgh Penguins exorcising their recent playoff demons and getting the team that elusive 4th Stanley Cup that seemed to almost be a given when a young and talented Penguins team won it all in 2009. I have a surprise meeting with the Philadelphia Flyers in the 2nd round. 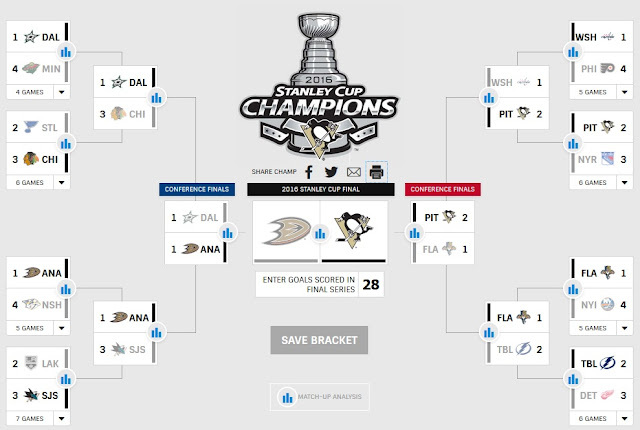 While most of the fanbase was undoubtedly rooting for the Flyers' elimination from the playoffs, I was hoping that they'd get the 2nd wild card. The Flyers and Capitals split the regular season series, and at the very least Philadelphia should give Washington a tough series. 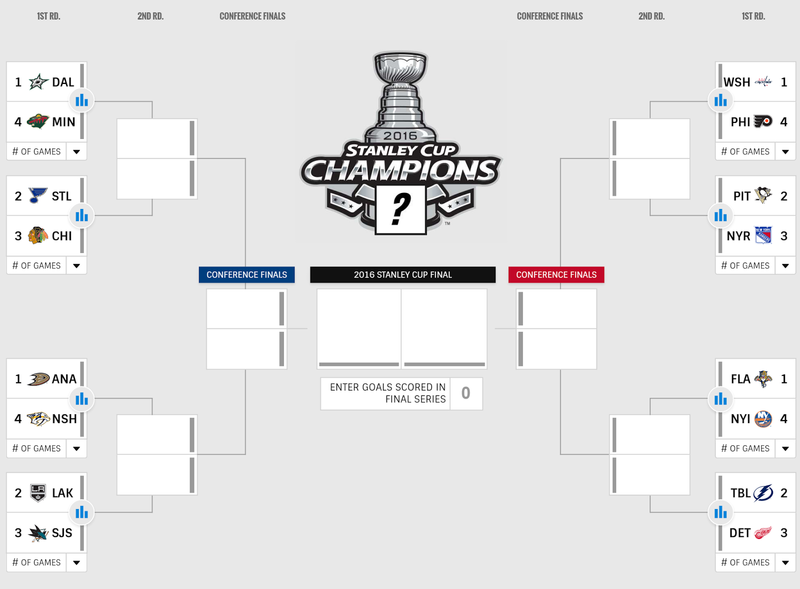 The Atlantic Division pod is easily the weakest in the bracket, and I like the Panthers to knock off a struggling Islanders squad and for the Red Wings to take down a Steven Stamkos-less Lightning team, with the Atlantic Division winning Panthers ultimately moving on to the Eastern Conference Finals. Out West, there seems to be a major difference between the top 3 seeds in each group and the 4th team, so I have the Dallas Stars and Anaheim Ducks cruising to playoff sweeps, while the Blue and Kings will have a much more difficult time getting past their opponents. I then see Dallas and Anaheim continuing their momentum all the way to the Western Conference Finals, with the Ducks prevailing. The Stanley Cup Final then becomes a match-up of two teams who looked dead in the water during the first part of the regular season but rebounded in major ways to finish off the season strong. In the end, it's Penguins who will be lifting the Cup again. I could give you an analysis about the choices I made. I could tell you that I think the Bolts have a deeper bench than people are giving them credit for. Or how the Sharks just got Nieto and Vlasic back and are out to prove something after missing the playoffs last year for the first time since 2003. Plus, they'd love to redeem themselves after their 2014 playoff loss to the Kings when the Sharks blew a 3-0 lead, and the Kings would go on to win the cup. But that's not really my bracket style. I just go with my gut, or fling feces at the wall and see what sticks. I try not to overthink it because that always gets me in trouble. (For example - Changing my NCAA champ from Villanova to MSU at the last second. Then taking 'Nova out of the Final Four altogether.) I either win triumphantly or lose spectacularly. Like Ricky Bobby- if I ain't first, I'm last. Oh, and I picked 28 goals because that was my softball number growing up. Zero thinking or analysis for that one. Whenever trying to predict any outcome in sports, there are three important factors; who's playing well at the time, who's healthy enough, and an historical context. 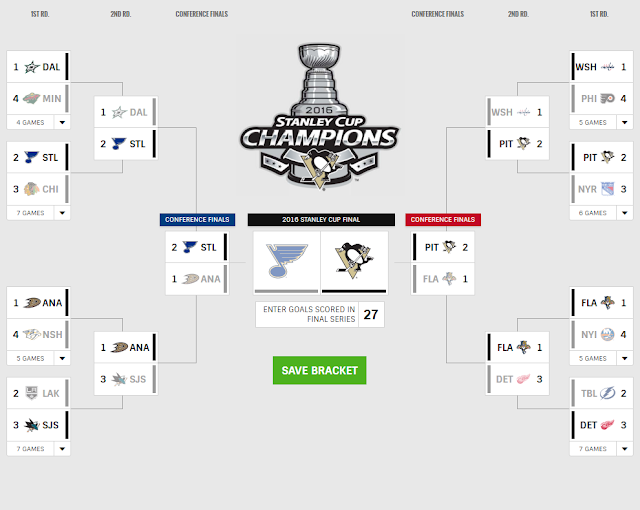 Keeping all that in mind, the first rule of the NHL Bracket Challenge is do NOT sip the Blues Kool-Aid. It may taste like fruit punch. Every flavor of Kool-Aid tastes like fruit punch, right? Even though, they are facing a weaker Blackhawks team than in recent years, it's still the St. Louis Blues in the playoffs. West: I tried to avoid it. I really did. But I had to go with more of the same, Chicago and LA. The Blackhawks roster didn't click as soundly this season and eventually all those games during the dynasty has to catch up, BUT they are still way too talented and deep across the board. Los Angeles is attempting to cement themselves as the other dynasty during the same time frame. Their size is just so difficult to deal with in a series. Honestly, the biggest Kings obstacle might be in the first round against a familiar Sharks opponent. I'm giving LA the bump in another classic 7 game series between these two West powers trading off cups again. 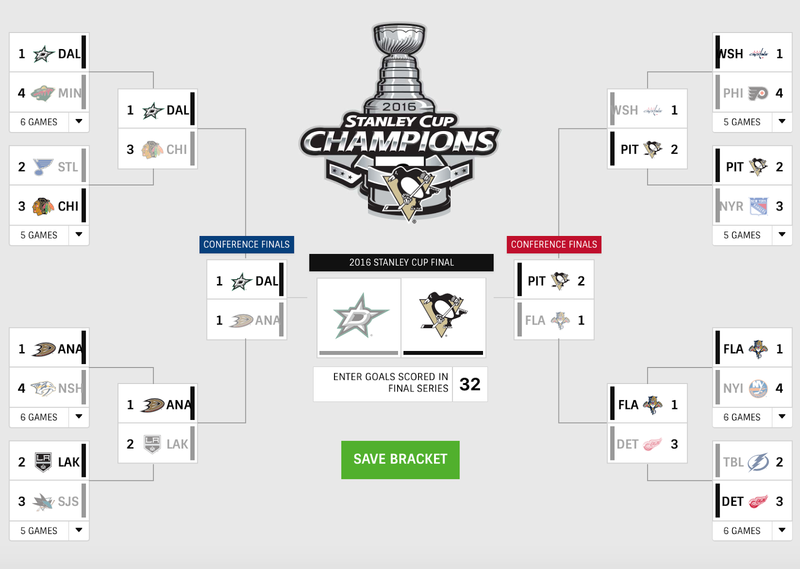 East: A Penguins and Capitals second round series will be the de facto Eastern Conference Final. It might even be the best series of the entire playoffs. I know Pittsburgh has played well against Washington this season and in the past, however, there's finally a different vibe with the Caps. Can Ovechkin really keep going without ever playing in a Conference Final?? Whoever wins this series should roll through to play for the Stanley Cup. Florida could do it. I'm leaning more that the Panthers are a year away from potentially being incredibly special. The Red Wings don't have the goaltending and depth. Detroit would need either Datsyuk to have a farewell tour for the ages or Larkin to have one of the best rookie playoff runs in history. Both are unlikely. Detroit over Florida was a questionable pick. Smart money would have Florida as having been a much better squad consistently. It's a pure gut feeling. This could very well be the most wide open field in almost a decade. I promise I wasn't trying to be biased. 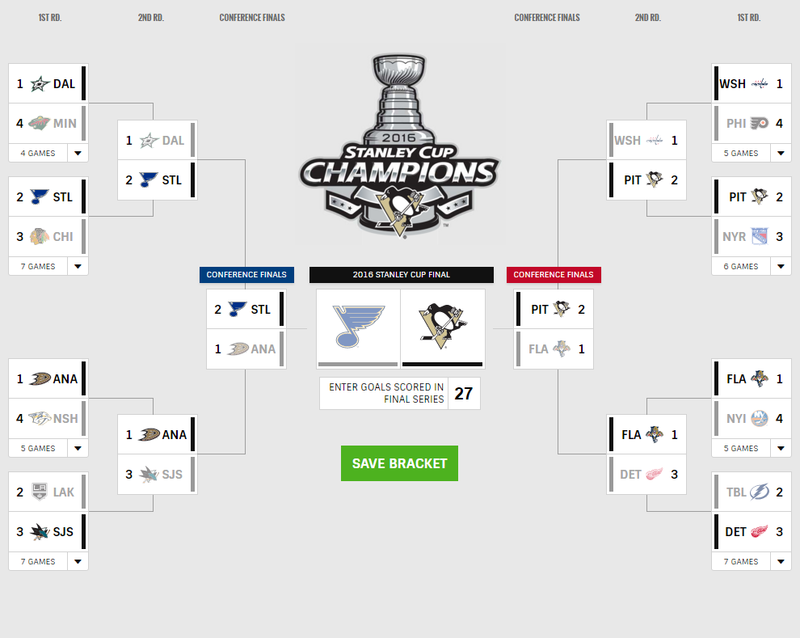 It's just really hard for me to pick against Pittsburgh right now. They've been playing so well down the stretch, which by the way also includes games missing Evgeni Malkin, Olli Maatta, Marc-Andre Fleury, and a few other regulars for periods at a time. West: If there is one team that can give Pittsburgh a run for the hottest team in the second half, it's Anaheim. I think they'll beat Nashville, but they wont go away as easily as everybody thinks they might. But I think the Dallas Stars have a good squad this year. Their offense is prolific and with the 3rd best goal differential in the league (Best in the West) I think this is the kind of team we can see making it to the Stanley Cup Final in the new NHL. 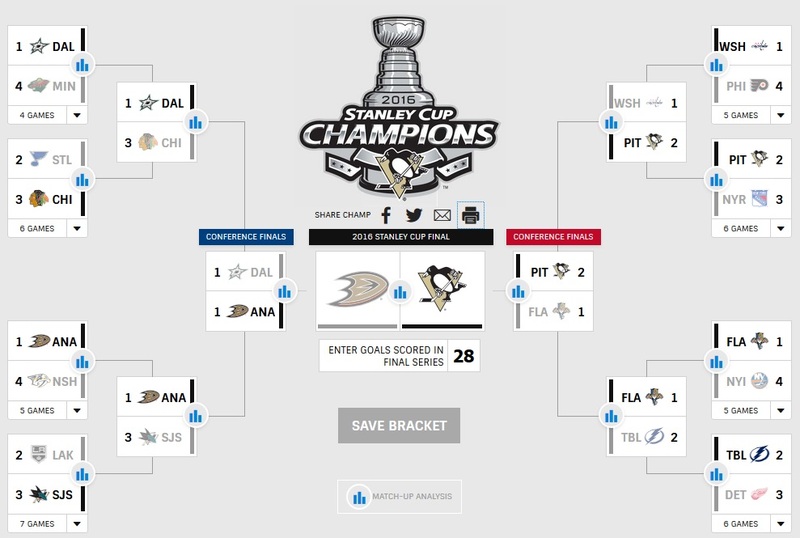 As much as I would love to see the Chicago Blackhawks lose in the first round, I can't in good conscience bet against them winning at least one round. That is, until they face Sequin, Benn, and the Dallas Stars. Whether its fair or not, the Sharks have accrued a reputation of playoff futility in recent years. That continues. The LA Kings have gotten hot again at the right time. Which will help them greatly, until they face an even hotter Anaheim Ducks team. In the end, I see Pittsburgh winning. This is provided, of course, they can get healthy and all the players projected to return to the lineup actually do. 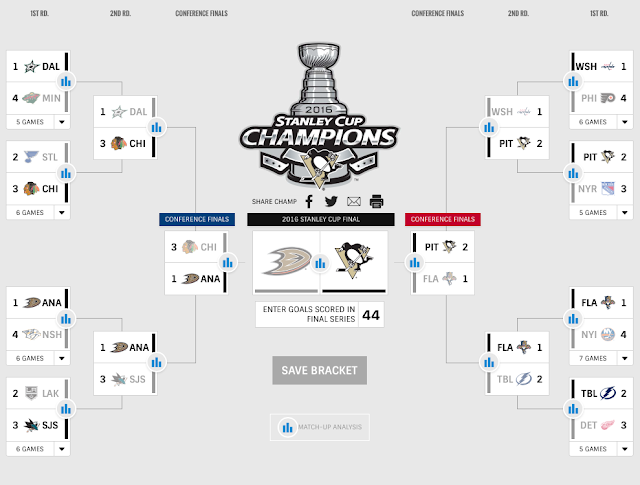 However with the way things have went in recent years, I also wouldn't be surprised to see the Penguins swept in the first round. (Sorry.) Let's hope its the former and not the latter! In the East there's no way Philly does much against the Capitals. Even with the Capitals struggles and the Flyers being one of the better team down the stretch, unless Holtby has a meltdown this one's a physical contest that ends in Washington's win. The Penguins, with Fleury likely to start, have a decidedly upper hand. Injuries have hampered an old and slow Rangers. Lundqvist will hold them in it longer than they should. The Islanders are a team looking for an identity against a Florida team who knows who they are. It'll go long but it'll end with Florida on top. Tampa may be beat up but the Red Wings are nothing to write home about. From there, the battle of Florida sees a healthier Panthers trump the beaten Lightning. The Penguins and Capitals will duke it out in a battle of titans. The match ups have favored the Penguins recently, and the overuse of Holtby in the regular season makes me think the Caps are primed for a collapse (though not as epic as in past iterations). From there a fast Conference Finals sees the Penguins avenging 1993, beating Jagr and the Panthers as poor Luongo continues to look for his legacy defining moment. The West is a mess, in a good way. So many good teams. The Wild are a mess. They are in shambles. The Stars make quick work of them. The Blackhawks will continue to be the bugaboo to the Blues. Anaheim will just be too much for a physical Nashville. San Jose will finally make good on some of the regular season promise they've shown over the years and take down the Kings despite being the lower seed. Though the Blackhawks have not been the sharpest team in the regular season, down the stretch at least, they'll be a tough match up for a fast Stars team. It'll be a close one but in the end experience will barely win out. Anaheim will have a tough Sharks team on their hands as a determined Joe Thornton looks to continue to shake his unfair "playoff failure" reputation. Despite Jumbo's best efforts, Anaheim's goal tending and team play advance them. From there the gas finally runs out on the Chicago engine. Two tough series and a bigger Anaheim break them down and see the Ducks advance to the Finals. 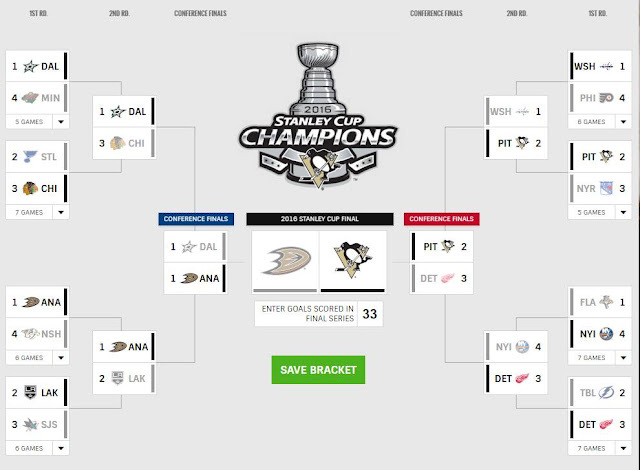 In a Ducks/Pens Finals anything can go. The strict Ducks defense and goaltending is a strong, strong match up against an exciting Penguins offense. It'll come down to which goalie tandem holds up strongest, be it Fleury/Murray or NHL best duo Gibson/Andersen. The onslaught will be too much for the latter and the Penguins will life Lord Stanley for the fourth time in their storied history.